Our excellent shaving brush, made exclusively from 100% natural soft badger hair will help you save time and money on expensive barbers! Choose the convenience of having your facial hair groomed at home or on the go in no time with a sturdy classic shaving brush that will gently exfoliate your skin and gives your beard a nice look. Manufactured from sturdy badger hair with an ergonomic handle to ensure firm grip, our brush makes your durable buddy in your daily shaving ritual. 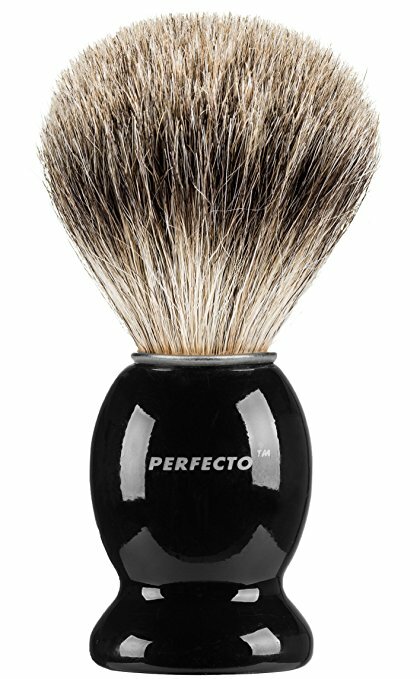 The shaving brush with its pure natural bristles treat your wet facial hair to a soft grooming! Our shaving brush may have the natural characteristic badger smell when used for the first time but don’t worry: It will go away soon! Also note that because this is a genuine badger hair brush, slight shedding may occur during the first few times of use. Finally, eliminate the moderate shedding of your badger shaving brush by avoiding hot water. Instead, use it with warm water to keep its hair soft and shiny, for longer top shaving performance!